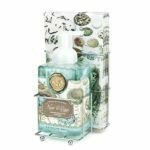 Michel Design Works home, bath and body display in The Backyard Naturalist will stop you in your tracks. 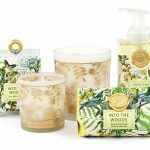 Updated seasonally, there are always new scents to explore — each derived from natural botanical ingredients with a unique, beautifully illustrated nature theme. 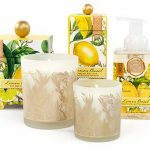 These luscious soaps, lotions, candles and home decor items are not just tried-and-true, classic gifts, but also reasonably priced for pampering yourself daily. A gorgeous garden in full bloom! 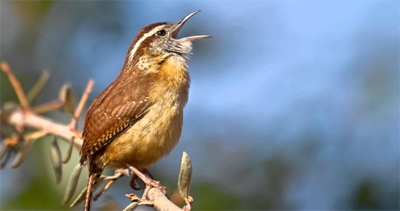 Hang on, Spring is almost here. It’s magic! 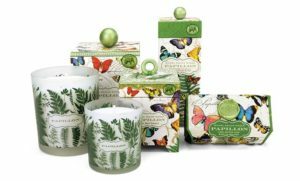 A kaleidoscope of butterflies brings fresh life and beautiful color to every room in the house. For a design full of movement and delight, we combined a classic, well-loved flower with an elegant, contemporary palette. 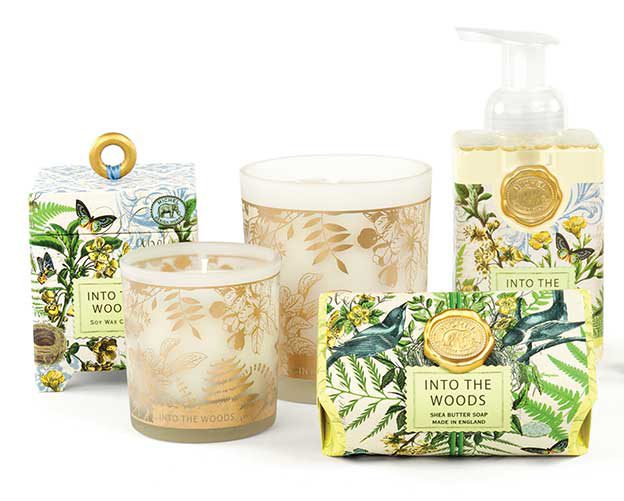 Blissful blues, warm yellows, and a sweet, relaxing scent conjure up the joy of serene summer days. 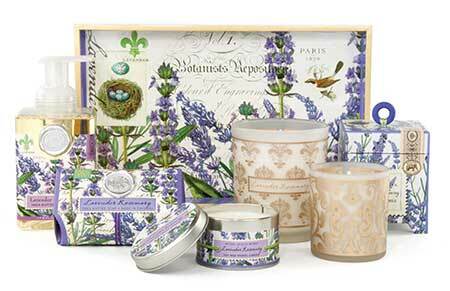 Nature speaks softly in the subtle colors, peaceful setting, and leafy green fragrance of this timeless design. 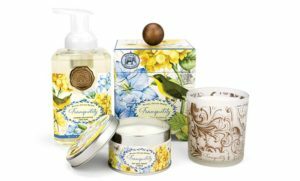 Our popular pairing of two quintessential summer aromas conjures lazy, sunny afternoons and soft magical nights. 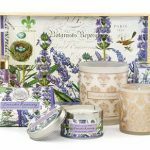 For bed and bath, sitting room and sunporch, nothing says a new season is coming like the colors and scents of enchanting lilac and flirty violet. There are coordinating trays, placemats, plates, napkins and so much more in an eye-popping variety of designs. 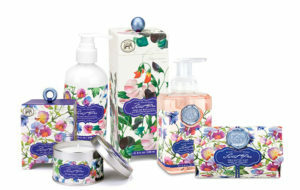 Michel Design Works make perfect gifts for people in your life who deserve a little pampering! Something for everyone! 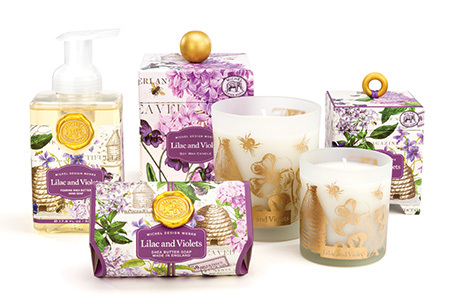 A wide variety of yummy, elegant scents and botanical themes. Combine and coordinate for exactly the right gift in the right budget. 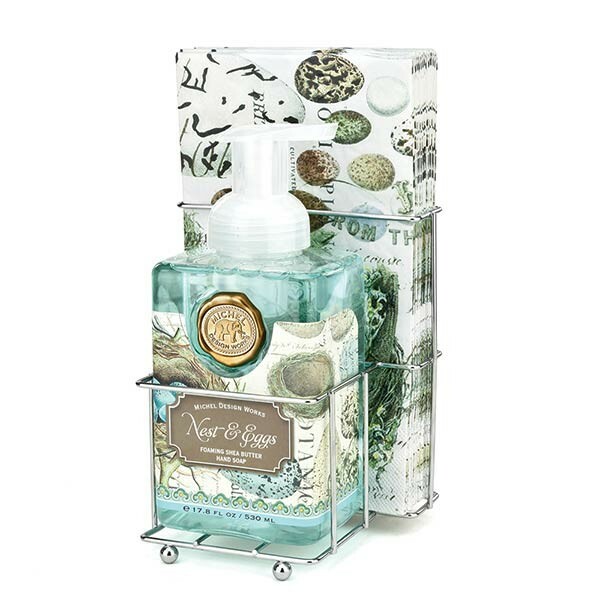 Michel Design Works original nature themed and detailed illustrations are unique to each scent. The designs perfectly adorn coordinating home accents. Foaming Hand Soap contains shea butter and aloe vera for gentle cleansing and moisturizing. Bath Soaps – Triple-milled bath bars are handmade in England of pure vegetable palm oil, glycerine, and moisturizing shea butter. Hand and Body Lotion – shea butter, aloe, and other botanical ingredients make this silky, luxurious lotion perfect for even the driest skin. 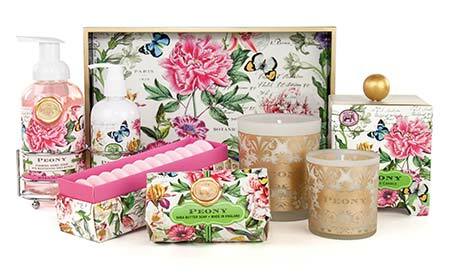 Beautifully packaged in a keepsake gift box. 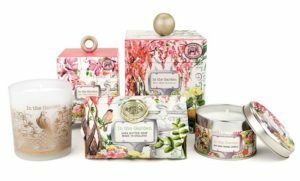 Scented Candles are handmade, all-natural 100% soy wax, a renewable resource that’s nontoxic, biodegradable, and burns clean. 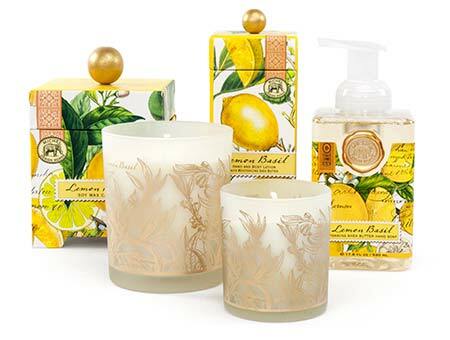 Candle comes in a printed glass container housed in a decorative box with a wooden ball top. 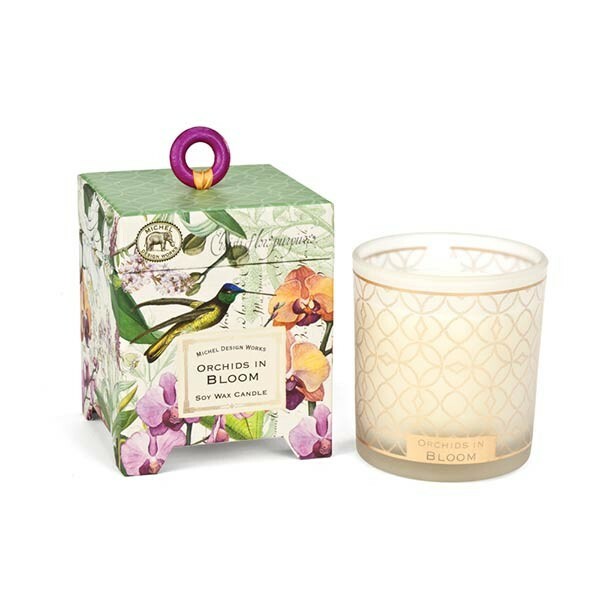 Or choose a travel candle in a handy tin to take a little bit of home with you wherever you go. Michel Design Works’ ever changing product line may vary in our store depending on the season. 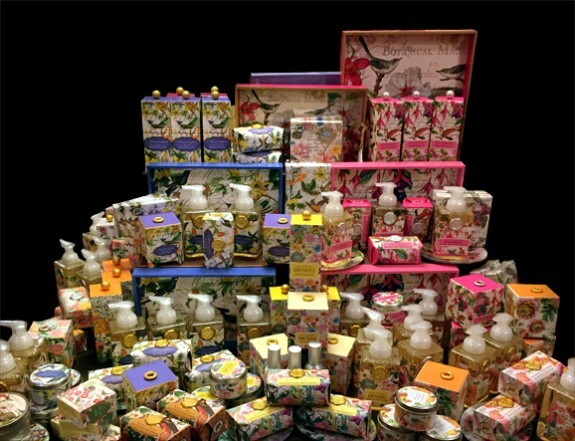 If you’re looking for specific scents, please feel free to stop in or call us to see what we have in stock. No animal testing is ever done on Michel Design Works products..